So, we made it to number 12. And what’s left to capture the essence of gardening? Well, I think I must put something in about legacy. So I’ve chosen an example of the humble pea, but not just any- an heirloom or heritage variety called ‘Alderman’. In an interesting article about the heirloom or heritage varieties of pea held at the John Innes Centre in nearby Norwich, Mike Ambrose describes how the number of varieties of pea mentioned in seed catalogues increased over the 19th century, though in truth probably many were not ‘new’ varieties but thought to be such by their discoverers. ‘Peas were one of the most highly prized vegetables not just because of their nutritional qualities but also for their ease of cultivation and the range of varieties that ensured a succession of fresh produce over an extended season from May to October. Seed catalogues from the 1800’s contained many pages of descriptions of the varieties and in many, peas were placed at the front of the list. The Suttons catalogue of Vegetable seeds lists 53 varieties of peas compared to 14 broad beans whereas EW King & Co catalogue lists 49 peas to only 8 broad beans. Arthur Sutton in his paper on the progress of vegetable cultivation during Queen Victoria’s reign, interestingly also starts with peas which he refers to as the ‘Prince of Vegetables’. The highly inbreeding nature of peas means that once fixed, particular variants or lines were particularly easy to maintain and it is clear from descriptions and illustrations as far back as the late 1500’s that peas such as parchmentless and fascinated types merited their own description and attributes (Gerard’s Herbal 1597). Prior to the rediscovery of Mendel’s work on the basis of inheritance in the early years of the 1900’s, there are clear references in the literature to selections being made from existing varieties as well as crossings between lines from which multiple forms were derived. In the absence of an understanding as to the underlying mechanism, the work was largely very largely empirical and selections in segregating populations resulting from crosses would have been only fixed for major characters leaving plenty of scope for further selection in subsequent generations. Such was the clamour for improved varieties from growers in a market where there was no restriction in seed marketing and references can be found that openly refer to the prolific development of synonyms. Sherwood in 1898 noted the anomaly that, “while the number of listed varieties in catalogues was falling, the number of names of peas were ever increasing as more and more new varieties were being announced or shall I say old friends with new names”. For us more modest gardeners, legacy may not be about breeding or discovering new varieties of plant and then finding a name for them (often of a cherished loved one, or for the more narcissistic, choosing one’s own name). Rather, it will be in leaving what we have created in our gardens and quite possibly what we pass on to sons, daughters and others (e.g. in school or community growing projects) by way of our skills and knowledge gained over many seasons. So, my penultimate object in this series symbolises our need (all too often neglected by the busiest gardeners) to sit and enjoy the fruits of our labours- the garden bench. And the one in the featured picture is made from reclaimed wood and, I think, looks rather inviting (especially with the addition of a couple of large cushions?). Having said this, there are probably not that many garden benches that are frequently used for sitting. Here at Old School Garden, over the years I’ve spread a number of these garden ‘must haves’ around (and have two more to restore/ assemble to place in key positions in my pond garden and to take advantage of the view across the fields to our local church). Apart from one or two used to take summer morning coffee (as an alternative to the rather more comfortable chairs on the terrace), these are not used for sitting. So, where should you position these essential garden objects? “The right places to sit in a garden have to be discovered. They cannot be decided in advance. Alan [her husband] once erected a two-seat wooden bench beneath the laburnum tree because it was sheltered from the wind, caught the sun and looked out towards Moel Siabod [a mountain in Snowdonia]. The classic ‘Lutyens Bench’- one to add a bit of class to your plot? ..and an older, rustic style design similar to the one I’m currently restoring.. He goes on to say that this discomfort doesn’t really matter, for garden benches are not, in general, intended to be sat on. ‘They are present to introduce the idea of repose’, he says, ‘which is perfectly justifiable in a place given over to the peace of mind, body and soul.’ Apart from this, they also have visual value in garden design- brightly painted to provide a focal point or attraction on a garden route, tucked in or under or around a tree to emphasise or frame it. Either way, the garden bench- in all its manifestations- for me is an essential of gardening. Whether it be just the idea of rest and soaking up the surroundings, or actually sitting down (perhaps mid gardening session) to sip a drink, with clipped conversation tailored to the real wish to watch nature at work. Hmm, the ultimate in benches designed not to be sat upon? No garden is complete- in my view- without some plants you can eat. Even if it’s only the leaves of herbs or flower petals to garnish a ‘happy salad’, growing our own food has to be a part of the essence of gardening. So today’s object is a traditional garden trug, used to gather in the fruits (and veg) of your labours. ‘Way back in the heydays of the 1820’s, just before Queen Victoria ascended to the English Throne, a Man of Sussex, one Thomas Smith of Herstmonceux, made a decision about his life that was to have a profound effect on Sussex and the World. He invented the Sussex Trug! Taking an ancient idea dating back to Anglo Saxon times, Thomas redesigned the historic “trog” and in so doing he created a part of the English gardening scene that is now World famous! The “trog” was a wooden vessel hewn from solid timber in the shape of the round coracle boat that the Anglo Saxons used for their daily business. Because of the way these “trogs” were made they were very heavy. They were used by Sussex farmers to measure grain and liquids and were made in several sizes for different measures. They continued in use in this form until the mid-1600’s and we have been able to uncover an inventory from a farm in Newhaven, East Sussex at about that time where there were recorded “a dozen of trogs in the milking parlour”. Thanks to a thoughtful birthday present from my wife, I now have two of these lovely baskets at Old School Garden. It is a joy taking them out into the garden, from early summer, to harvest fresh produce and then use it as quickly as possible in the day’s main meal. Celebrity gardener Bob Flowerdew underlines the importance of getting your pickings as quickly as you can from plot to saucepan to maximise the sweetness; as soon as it’s picked a sweetcorn’s, or whatever’s natural sugars start to convert to starch. I guess the trug is a good token for all the other containers we use in the garden (including the modern day plastic trug); whether it be to carry flowers, tools, weeds, compost and so on. But most importantly, it is the symbol of all that’s good in ‘growing your own’ and the freshness and flavour that comes from this small contribution to world food production. ‘Weather watching’, or rather using forecasts of it and then responding so as to maximise plant growth and health, is a central task for most gardeners, especially those growing food. So my next object (no it’s not a weather vane), marks the massive progress there’s been in forecasting over the last 50 or so years; it’s one of the first satellites to be launched with the aim of improving meteorological forecasting, the TIROS-1. Launched way back in 1960, the TIROS Program (Television Infrared Observation Satellite) was NASA’s first experimental step to determine if satellites could be useful in the study of the Earth. At that time, the effectiveness of satellite observations was still unproven. Since satellites were a new technology, the TIROS Program also tested various design issues for spacecraft: instruments, data and operational parameters. The goal was to improve satellite applications for Earth-bound decisions, such as “should we evacuate the coast because of the hurricane?”. The TIROS Program’s first priority was the development of a meteorological satellite information system. Weather forecasting was deemed the most promising application of space-based observations. TIROS proved extremely successful, providing the first accurate weather forecasts based on data gathered from space. TIROS began continuous coverage of the Earth’s weather in 1962, and was used by meteorologists worldwide. The program’s success with many instrument types and orbital configurations lead to the development of more sophisticated meteorological observation satellites. Read more here. We gardeners have benefitted enormously from improvements in both long and short-term weather forecasting; I especially like the three-day forecasts broadcast on the BBC here in the UK, which usually turn out to be pretty accurate. Of course, with climate change affecting weather patterns, leading, it seems, to ever-increasing ‘unusual’ weather events, the future challenges for gardeners and growers (as well as the general population) are perhaps greater than they were. The worst effects of extremes of wet, dry, wind, hot and cold can be ameliorated with physical changes to the layouts of our gardens to create ‘micro climates’ and we need to be ready to supply extra water and perhaps food for plants in times of drought. So, while a weather satellite might seem a bit removed from the essence of gardening, I think it symbolises both gardeners’ historic need to monitor and forecast the weather (perhaps with something as basic as a weather vane), and our continuing need to do this, using technology to arm us with the information we need in more unpredictable times. This object is all about constructing a garden or shaping the ground. I thought a good choice would be another tool, a ‘half moon’, used for creating edges to lawns or giving shape to borders. 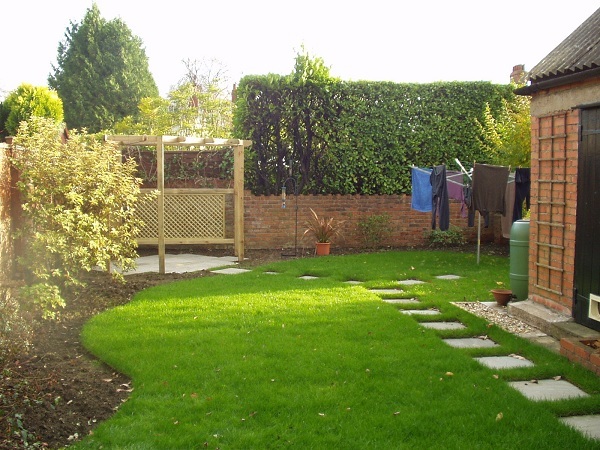 It’s great thinking about and perhaps drawing up your garden design ideas, but even better putting them into action. Sometimes (perhaps more often than I care to admit), I find the design process is more satisfying by going out, looking at the garden, grabbing your tools and shaping or constructing things there and then. A bit risky sometimes if you don’t fully appreciate the impact of your ‘on the spot’ decisions on the rest of the garden. However, when using a half moon, perhaps in combination with a nicely curving hose pipe as a guide, it is really satisfying seeing the new, crisply flowing line of a border with its freshly dug soil, emerging from the adjoining grass. Alas, my opportunities for this here in Old School Garden are getting fewer, as I move from an expansionist phase to one focused on creating a more manageable garden, and if anything, reducing the amount of planted space and to put back easier to maintain lawn and hard surfacing…but don’t mention this to my wife! ‘In a nutshell, people who garden by the phases of the moon believe that its gravitational pull on the earth’s water (i.e. tides), has a bearing on plant growth. They never plant anything when the moon is waning in the last quarter because it’s believed that the earth’s water table is receding. After the new moon, the water table rises again and planting can resume. Farmers on the continent have been using moon phases to guide them for years, as indeed have many gardeners in the UK. See more of her interesting article here. A bit of cheating again! My seventh object in this series about the essence of gardening is really at least two objects with a common name- compass or compasses. For me these two objects symbolise the importance of design in gardening- the conscious act of choosing and positioning what plants and other garden elements are used and where. This can be as simple as thinking about where to place different plants or elements in the garden; by knowing where the prevailing weather patterns are coming from (wind and rain), as well as the direction and strength of light and heat from the sun. For this a magnetic compass is a very useful to back up to observation and wider knowledge. And nature has it’s own ‘compasses’, too. The plant Silphium laciniatum, has a common name of ‘Compass plant’ inspired by the “compass orientation” of its leaves. The large leaves are held vertically with the tips pointing north or south and the upper and lower surfaces of the blades facing east or west. A newly emerging leaf grows in a random direction, but within two or three weeks it twists on its petiole clockwise or counterclockwise into a vertical position. Studies indicate that the sun’s position in the early morning hours influences the twisting orientation. This orientation reduces the amount of solar radiation hitting the leaf surface. Vertical leaves facing east-west have higher water use efficiency than horizontal or north-south-facing blades. Early settlers on the Great Plains of the North America could make their way in the dark by feeling of the leaves. Equally, garden design can involve recording your current plot and devising new elements and patterns for your garden (borders, paths, specimen plants, hard landscaping features). For this, a pair of compasses is a vital tool in plotting key elements in your existing garden (through the technique of triangulation) and also in drawing circles or arcs in a new design (and then setting these out on the ground). Dividers and compasses are drawing instruments that have been used since antiquity to measure distances, transfer lengths from one drawing to another, and draw circles. The Greek mathematician, Euclid, limited the constructions in his Elements of Geometry to those that could be done with an unmarked straight edge and rudimentary compass. Ancient Roman dividers survive in the collections of the British Museum. Before the 18th century, when one leg was modified to take a pen or pencil point, compasses had two sharp points, like dividers. The user scratched the writing surface in the shape of a circle and then inked the scratches. Number six in this series of posts on what makes gardening is all about learning and giving. We can learn about gardening in formal and informal ways and ‘on the plot’, in the classroom and online. For many, if not most gardeners, learning is usually informally, from other gardeners and especially through visiting other gardens. So my chosen object is an annual booklet of the NGS- the National Gardens Scheme (I’ve selected last year’s Norfolk booklet out of local loyalty). In 1859, William Rathbone, a Liverpool merchant, employed a nurse to care for his wife at home. After his wife’s death, Rathbone kept the nurse on to help poor people in the neighbourhood. Later, Rathbone raised funds for the recruitment, training and employment of nurses to go into the deprived areas of the city. Later in the Nineteenth Century, based on the idea of local nursing set up by Rathbone, `District` nursing spread across the country. With support from Florence Nightingale and Queen Victoria, the movement became a national voluntary organisation setting standards and training nurses. Then, in 1926, the organisation decided to raise a special fund in memory of their patron, Queen Alexandra, who had recently died. The fund would pay for training and would also support nurses who were retiring. A council member, Miss Elsie Wagg, came up with the idea of raising money for charity through the nation’s obsession with gardening, by asking people to open their gardens to visitors and charging a modest entry fee that would be donated. The year after, in 1927, The National Gardens Scheme was founded. Individuals were asked to open up their gardens for ‘a shilling a head’. In the first year 609 gardens raised over £8,000. A year later, the district nursing organisation became officially named the Queen’s Nursing Institute. In 1980 the National Gardens Scheme Charitable Trust was established as an independent charity and since 2010, a different annual ‘guest’ charity has been chosen from recommendations from NGS volunteers. We opened Old School Garden up to the public in 2013 for one day (not as part of the NGS, but with proceeds going to three local good causes), so I know how much hard work, excitement and enjoyment comes from doing that (we might have another go one day…). I’m also an enthusiastic visitor to other gardens, as you’ll have seen from many posts on this blog! And the charitable impact of this sort of scheme can’t be overstated. Since its foundation, the National Gardens Scheme has donated over £45 million to its beneficiary charities, of which nearly £23 million has been donated within the last ten years (£15.2 million to Macmillan Cancer Support alone since 1985, being that charity’s largest donor). So, the NGS is both a potent symbol of gardeners’ eagerness to learn – and to give. OK, this is cheating bit, I suppose. I wanted my fifth object to capture several things; but all of them involve cutting. Finally I decided on a plant, or rather a plant treated in a particular way; topiary. In this case at Levens Hall, Cumbria. Pruning plants is a key gardening task; to stop or promote growth, to shape plants, to remove dead or diseased material, to propagate – and of course we should include grass cutting here. I could equally have chosen a pair of secateurs or perhaps a lawnmower, but the clipped shapes of yew, box, or other species capture for me this important garden task and also symbolise what you might call the core ingredient of gardening; the conscious act of doing something to enable a plant to grow and to grow in a particular place or way. Topiary’s clipped shapes transform the wayward beauty of nature into forms and masses which can add structure and give pleasure; when standing alone or providing a foil for swaying grasses, nodding allium heads or cottage garden favourites. I know there is one school of thought that says this, sometimes drastic, technique seems unnatural, which is certainly true. But then again gardening is about the directing, guiding and controlling of nature. And I have to say, as a fan of topiary, it can make a garden fun. Just look at this combination of geometric shapes at Levens Hall, some of them centuries old. And when you search for topiary on the internet- which I suggest you do- you see all manner of human, animal and other forms, cleverly cultivated and maintained for our enjoyment. Number four in this new series of posts took a bit of pondering. I wanted to capture the importance of ‘cutting out the competition'(weeding) and at the same time find an object to stand in for all those other tools of cultivation we gardeners use to loosen, till and maintain the soil; for seed sowing, planting, and incorporating stuff to benefit plants- manure and other organic matter as well as inorganic fertilisers. So I went for probably my favourite tool in this category, a hand fork. The image above also shows my preferred model in this wide range of available hand forks; one with a shaped handle and relatively short, stainless steel prongs. Apart from the effort to kneel or crouch (my back and knees aren’t what they were), weeding with a hand fork (or by hand) must be one of the most satisfying of gardening jobs. Taking out shallowly rooted weeds and other unwanted growth around your preferred specimens, especially in sandy loam soil like we have here in Old School Garden, it is a relatively easy task too. And once those rows of veg, stretches of mixed border or pots of spring bulbs have been cleared you can stand back and admire how you’ve improved the presentation of your plants; the finely worked, bare soil also provides a wonderful foil to all that fresh foliage and, later, the hues of the flowers and fruit. And we mustn’t forget those other cultivation and weeding tools; the forks, spades, rakes and tillers that all help to keep your soil healthy, alive and weed free. The third object in this series is of historic importance. The Wardian Case, originally designed by Nathaniel Bagshaw Ward in 1829. It became a vital tool for those intrepid plant hunters of the 19th century. Without it, many of the exotic plants that now thrive in the U.K. would not have survived even half their journey from the far corners of the world. Early plant hunters had been actively searching the world for new exotic plants from the end of the 16th century. But transporting their discoveries as seeds and dry roots because of the dehydrating sea air and a substantial lack of fresh water caused many plants to perish. The Wardian Case provided protection from the salty wind, created a mini greenhouse where the plants could use sunlight and produce their own water through condensation. And the Case is not only of historic importance in explaining the wide range of plants now available in the U.K. It also symbolises the ways in which gardeners try to create micro climates to nurture an exotic plant or even a range of plants. They do this by growing them under glass (and a few years after Ward’s invention an explosion in greenhouse manufacture began), sheltering them from the excesses of sun, wind and rain or creating plant colonies which support each other, possibly altering the soil too.